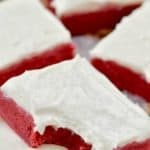 These Red Velvet Bars are decadent, delicious, and topped with the best cream cheese frosting! If you love red velvet cake, then these red velvet sugar cookie bars are the thing for you! Cream together the 14 TBSPs (1 3/4 sticks) butter and 1 1/2 cups sugar until light and fluffy. Add in the eggs, one at a time, then 2 tsps vanilla, 1 TBSP white vinegar, and 1 TBSP red food coloring. The dough will be very sticky. Press it into the bottom of the baking dish and bake for 20 to 25 minutes. Allow to cool completely before frosting and adding sprinkles.